Who Will Control the Situation in Syria’s “De-Escalation Zones”? A month ago, a memorandum on the establishment of four de-escalation zones in Syria came into force. According to the agreement, the de-escalation zones were established in the provinces of Idlib, Hama, Aleppo, northern part of Homs, Eastern Ghouta, Daraa and Quneitra. Currently, many parties, including the Syrian government, have recognized the high effectiveness of this agreement. However, it is not fully known who will control the situation in the de-escalation zones, and whose troops will guarantee the observance of the ceasefire. We can assume that Turkey is going to monitor the situation in Syria’s Idlib. However, according to Syrian experts, Turkey is already trying to control some part of the Syrian territory through economic and humanitarian ways. When it will be allowed to enter its troops in Syria to guarantee security, Damascus will not be able to withdraw the Turkish troops later either by military or diplomatic methods. In addition, Turkey’s interference can also be strongly criticized by Saudi Arabia that has supported the armed opposition throughout the Syrian conflict. Such assumptions are likely exaggerated. Considering the fact that Ankara is now in international isolation, and the West has actually stopped supporting the Turkish side, it is simply not profitable for Turkey to spoil relations with other guarantors of the settlement of the Syrian crisis. Turkish President Recep Erdogan has no choice but to leave his imperialist ambitions and support those who intend to stabilize the situation in the region. In addition, it raises many questions to the southern zone. It is still not clear who will control the situation in the south, in the Golan Heights. 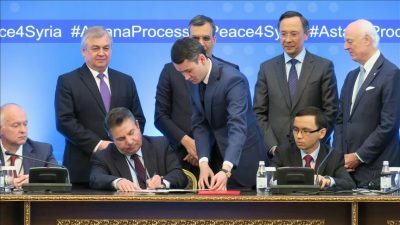 It is obvious that the Syrian government will support Tehran’s participation in controlling the situation in the de-escalation zones in the south of Syria. This will also allow Iran to get a way to Lebanon. Thus, Iran will be able to strengthen cooperation with Hezbollah and increase influence over the internal policy in Lebanon. However, this idea is likely to be strongly criticized by Israel, since Tel Aviv opposes any Iranian military presence in southern regions of Syria, and in particular, in the Golan Heights. Most likely, Israel will offer another candidate, and it probably will be Washington. It’s known that the United States has planned an invasion of the territory of Syria. According to this plan, the U.S. is ready to use both Jordan and Britain (reference). Earlier, Inside Syria Media Center had already touched upon this issue. However, then we said that the Pentagon intended to hide behind the defense of its ally in the coalition. Now the proposal of Israel will be just in place and will not require any efforts from Washington. Considering all these disputes and assumptions, it is obvious that the issue of monitoring the situation in the de-escalation zones will be opened for a long time. However, confidently, de-escalation zones justify their mission. Under-Secretary General for Humanitarian Affairs and Emergency Relief Coordinator, Stephen O’Brien, stressed that against the background of the recent coalition’s indiscriminate air strikes in Syria, only four de-escalation zones could normalize the situation in Syria. Anna Jaunger is a freelance journalist at Inside Syria Media Center.